and most boutique / foreign brands. GSAR is one of the most well-reviewed appliance repair services in South Bay. With 150+ reviews on reputable sites like Yelp and Google and over 95% 5-star reviews, we guarantee quality workmanship and a pleasant service experience. Over 80% of our repairs are completed by the company’s owner: Don Castro. All work is owner-supervised and we’ll make efforts to address even the most complicated appliance repair problems which would cause other repair services to throw in the towel. Our mission is to save appliances from the landfill and to keep them running in good working condition for years to come. Where other services may give up and condemn an appliance to the landfill, we’ll keep at it until we’ve explored all options for repair. Please note: GSAR is on vacation! We will be closed from April 9th, 2019 to April 22, 2019, re-opening Tuesday, April 23. For appointment requests covered under our warranty, please use our contact form and we will respond within 24 hours. GSAR is an appliance repair company serving Sunnyvale and surrounding areas. We guarantee quality workmanship and a friendly service experience, and we’re usually able to provide service within 72 hours of your appointment request. Our service area includes the southern portion of East Bay, South Bay, and parts the Peninsula, from Newark looping around to Menlo Park. With 150+ 5-star reviews on Yelp and Google, GSAR has established itself as a premier appliance repair service for Bay Area residents. We are a small, customer-focused appliance repair company, and we seek to provide a dedicated service to residents of Sunnyvale and surrounding cities rather than to grow too large and be forced to compromise the quality of our services. Looking for an appointment for appliance repair? You can book an appointment using our service request form — and if you have any questions you need answered prior to booking service, please don’t hesitate to contact us. For more information about our company and its owner, please check out Who is GSAR? For more information about to expect when using our service, check out Our Process. 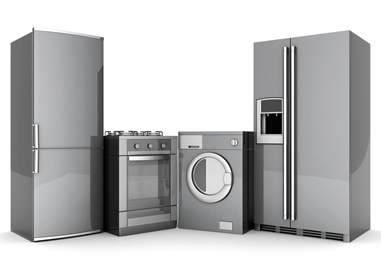 GSAR services major appliances: refrigerators, freezers, ovens, stoves, ranges, cooktops, clothes dryers, washing machines, dishwashers, microwaves, and garbage disposals. We work mostly on residential appliances, but we service some commercial brands as well — please contact us for details. We repair all common brands, including: Admiral, Amana, Electrolux, Estate, Frigidaire, GE, Hotpoint, Jenn-Air, Kenmore, KitchenAid, Magic Chef, Maytag, Roper, Westinghouse, and Whirlpool. We repair many boutique / high-end / foreign brands, including these: LG, Samsung, Bosch, Dacor, DCS, Fisher & Paykel, Gaggenau, Miele, Speed Queen, Sub-Zero, Tappan, Thermador, U-Line, Viking, and Wolf. For more information, please check out our service details page. Need to book an appointment for appliance repair? Please use our service request form.